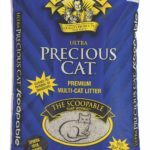 ScoopFree Ultra Automatic Litter Box Review - MUST READ! 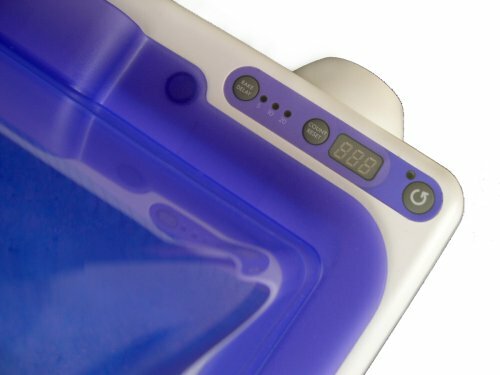 (3.8/5)ScoopFree Ultra is an automatic cat litter box that uses disposable litter trays with blue crystals to absorb urine and control feces odor. ScoopFree Ultra’s rake automatically cleans and pushes the waste into a covered compartment 5,10 or 20 minutes after your cat has used the litter box. If your cat re-enters the unit during this time, sensors reset the litter box for another 5,10 or 20 minutes, depending on the programming. The waste compartment is located on the front side of the disposable tray. 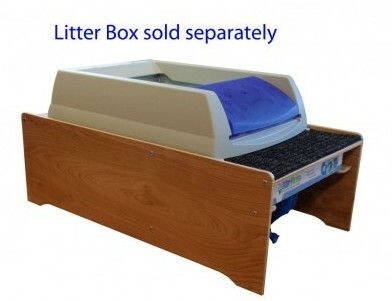 The disposable tray forms part of the automatic litter box as the bottom of the unit so when cats do their business on the litter area and this tray gets dirty enough, all you have to do is slide out the tray from the unit, toss it and replace it for a new one. Manufacturer recommends replacing the tray once every 20-30 days with one cat, every 10-15 days with 2 cats, and every 7-10 days with 3 cats. If you have more than 2 cats is recommended to buy more than one unit. Privacy hood, to give your cat the privacy he or she likes. Adjustable rake delay to program the cleaning for 5, 10 or 20 minutes after your cat has used the litter box. 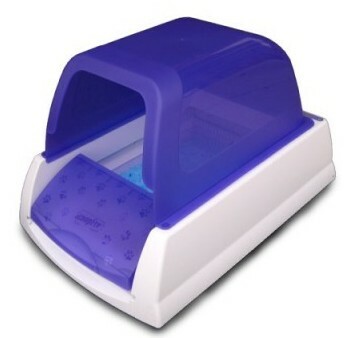 Health counter, to track how often your cat uses the litter box. You can check a full review of the Original version here. It automatically scoops the litter box. Blue crystals have low tracking and they are dust-free. Crystals have the capacity to absorb cat’s urine and feces thus helps to reduce odors. Ultra includes Privacy Hood, Adjustable Rake Delay and Health Counter. 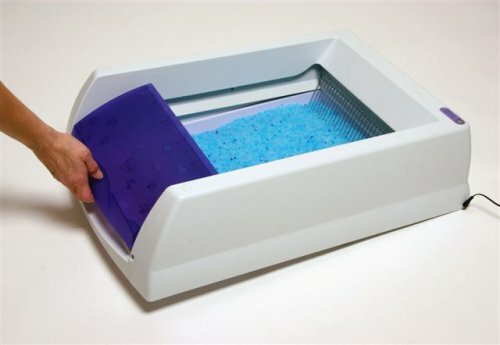 Unique system that uses disposable litter trays pre-filled with blue crystals for best odor control. Convenient cleaning of the litter box, just changing the used tray for a new one. Rake stops moving in case of a blockage. 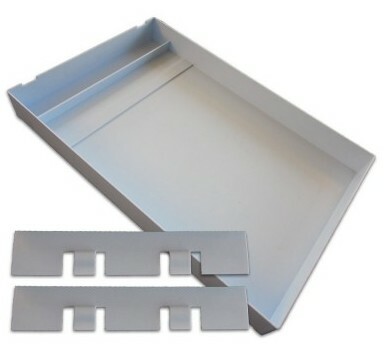 Disposable trays come in Original Scent, Lavender or Dye-Free. When a cat enters the litter box and urinates on it, the blue crystals absorb and deodorize the urine. After 5, 10 or 20 minutes the ScoopFree’s rake runs through the crystals and re-distribute them flat again (cats dig and create piles of crystals). As the urine is absorbed by the crystals, it does not create clumps so no waste gets deposited into the ScooFree’s waste trap. If the cat defecates the ScoopFree’s rake pushes the clumps into a waste trap which opens to collect the clumps and closes as the rake gets back into position. The ScoopFree’s purple waste trap cover and the cardboard waste trap are attached by magnets and work together as a unit, opening and closing together to receive the waste. The cardboard waste trap is filled with more crystals so when it shuts down it traps the odor so the blue crystals can absorb it. ScoopFree’s rake does not get jammed as other brands because it changes the direction it points as it sweeps to the front and back to the rear of the litter box. Crystals are made of silica and they work better with dry and fresh air, with humidity crystals don’t work well and might not cover odors effectively. To change the cartridge just lean the unit against the wall, slide to remove the old cartridge, slide in a new cartridge, place the plastic back down, pour fresh crystals. Put the old cartridge in a trash bag and dispose of it. Keep the unit away from high humidity. Trays last shorter when used by cats with a high in crude fiber and ash content diet because they defecate more. Old cats and cats with diabetes, urinary diseases or thyroid problems urinate more so the tray lifespan is shorter. Kittens will cause a shorter lifespan of trays as well as they urinate and defecate more often than adult cats. ScoopFree is not designed to be used by kittens under 6 months old. Stirring litter crystals often extend the life of the tray. Make sure to mix in the crystals from behind the rake and along the sides of the litter box. What are the Pros and Cons of the ScoopFree Ultra? It scoops effectively without jamming like other rake types of litter boxes. Crystals offer good odor control, absorbing liquids and drying solids. Blue crystals don’t track or create dust as much as clumping litter. Counter that helps to track how often your cat uses the litter box. Privacy Hood for cats that like enclosed litter boxes. Much less maintenance than other similar brands. No need to scrap the bottom of the pan anymore. 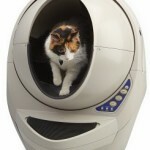 The unit can go on its own for weeks if used with one cat and follow the instructions. It makes some noise but much quieter than other rake-type automatic litter boxes. Short cleaning cycle, approximately one minute. You have to buy cartridges to maintain the system. It gets expensive with more than one cat. If a cat is a digger and creates big piles of clumps, this could block the motion sensors. If a cat scratches vigorously after doing its business it could scratch the cardboard bottom. The waste trap is not sealed. You have to stir the crystals often so the cat doesn’t use the same spot every time. Cartridge gets heavy when dirty. Not good for cats that use only the corners of the litter box. The litter area is not very big (14” x 14”). Some cats urinate against walls of the litter box creating leaking between the box and the tray (this happens occasionally and only with some cats). Cartridge lifespan could be shorter than advertised, depending on various factors (see instructions how to maximize the lifespan of cartridges). Some cats might not adapt to the crystals. Magnets don’t strongly attach to the purple plastic waste trap cover. If you want to increase the lifespan of the cartridge, make sure to stir the litter once a day to facilitate crystals absorption and to make your cat to use a different spot in the litter area. Silica crystals need good air circulation to eliminate odors because it works with evaporation. 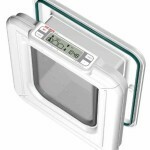 So a good tip is to place the unit close to a window or door that you can open or put a small fan above the box, blowing air constantly down onto the litter. If your cat is a digger, check the green light daily to see if the sensors are blocked by litter piles. To help your cat adapt to the crystals, pour some crystals on the old regular litter box mixed with regular litter and let him use the regular litter box for some days. Some ideas to reduce odors: sprinkle some baking powder on the crystals and under the waste compartment. Also, buy an activated charcoal odor absorber and place it on the inside of the waste compartment. Another good idea is to get the Febreze Hamilton Air Filter and plug it into the outlet right next to the ScoopFree. This filter removes the odors completely. If you have several cats and cannot afford to replace the cartridge often, there are some alternatives that customers have used to avoid this expense (keep in mind that these alternatives are not part of ScoopFree brand). – The crystals need to be the right size for the ScoopFree to work. If the crystals are too large the rake drags crystals with it and it is a mess. If crystals are too small, they might get inside the motor. So, you need to buy the closest crystal’s size to one of the cartridges. Some customers recommend Fresh Step Crystal litter because it has a moisture activated perfumed that is released when in contact with waste. 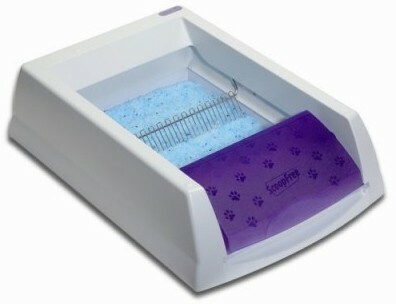 Other customers have used the Forever Tray with clumping cat litter, such as Fresh Step clumping litter or Arm & Hammer Natural clumping litter, requiring only scraping the bottom pan from the urine every 2 or 3 days. To clean the Forever Tray once empty, make sure to hose it down and dry it off before using it again. If you don’t dry the permanent tray, the crystals will soak up the water and they will get ruined. Check a Forever Tray review to know more details about this alternative. Using the ScoopFree with the Litter-Bagger System. This is another alternative which consists of a wooden platform with a hole in it and a bag attached to it. So when the ScoopFree rakes the clumps, instead of going to the waste compartment, they fall into the bag located on the front side of the Litter-Bagger. This system comes with its own permanent tray. When it is time to change the litter you can just scoop the wet litter through the hole into the bag and fill the tray with new litter. Grab the bagged waste and toss it. The system will cost more than other rake type brands and especially if you have more than one cat, but on the other hand, it is a convenient system to use with disposable trays. With one small or regular size cat and normal use, the cost of cartridges is approx. $30 by month. The cartridge lasts about 10 to 20 days with one cat but you still might need to scoop the waste trap from the tray every 3 or 5 days. The replacement of the trays can be stretched longer if you place the unit in a basement or away from the living area. If your budget is tight you can get around from buying the cartridges with the alternatives described by customers. The unit is not suitable for cats that eat by-products because they create soft and very abundant feces. If you want to be able to adjust the delay cleaning cycle (the Original does not have this feature). For cats that urinate excessively or defecate soft feces. I have a scoop free cat litter system for my cat Prada. She is constantly itching in spite of the vet changing her cat food twice. Could she be allergic to the blue and the white crystals used in this system?. I am 68 years old and I live on the second floor of an apartment building. I have always been sensitive to odors so my son purchased the scoop free cat litter system for Prada and me. Her cat food now costs $63,00 a bag but she is still always itching her paws, tail and her ears. Actually, she itchy all over. I live on a fixed income so the food is expensive and the litter is expensive but I have to figure out how to make my friend less miserable. Please advise. Hello Dawn, I understand your concern. My cat used to itch all the time and I thought it was the cat food but turned out to be fleas. This is a very common problem in cats. We tend to think indoor cats don’t have fleas because they don’t spend time outside, but sometimes just visiting the Vet office can get the cat exposed to flea eggs or us visiting a friend who’s pet has fleas which we carry in our clothes. Sometimes we carry the fleas from the streets, as crazy as it sounds, it’s true. Just to discard your cat from having fleas apply Front Line Gold and check how your cat does. If the itching persists, switch the litter box for some days to a regular litter box with clumping litter. If the itching ceases, it means your cat is allergic to the crystals. I hope I could help Dawn and I wish you find the solution for Prada.